Redcar Bears are the only team who can put the squeeze on Edinburgh Monarchs in the race for the fourth and final play-off position – and it’s turning in to quite a battle. Monarchs occupy fourth spot in the Championship on 54 points having ridden 27 matches. Redcar are in fifth position on 49 points having ridden one more meeting, making tonight’s clash between the teams at South Tees Motorsports Park a very important fixture indeed. 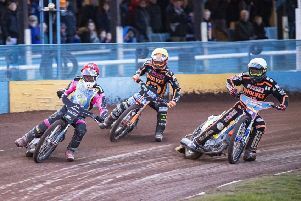 Monarchs team manager Alex Harkess said: “I think Redcar are the only team still capable of catching us, although they still have some very difficult matches to come at home. “It’s everything still to play for and our fate is not in our own hands yet. Monarchs, who still have to face Glasgow Tigers and Ipswich Witches, the other two play-off contenders, at Armadale, can’t afford any slip-ups. They need to bounce back in the wake of Sunday’s 55-35 defeat against league leaders Sheffield Tigers at Owlerton. Second string star Max Clegg, who failed to score at Sheffield, drops down to reserve under the new averages, swapping places with Australian Josh Pickering. “Max did well at reserve before and we have to hope he does the same again,” admitted Harkess. Pickering is back in the groove again after a lull in his scoring. He won heat eight at Sheffield, beating Todd Kurtz and Jan Graversen, and his ten points was his third double-figure return on the bounce. Said Pickering: “I started off with a bike issue at Sheffield but we discovered what the fault was straight away and I was happy to get my heat win. “Sheffield is a real specialist type of track and the Sheffield boys all ride it so well. The track was a bit different since the last time we there at the start of the season. Erik Riss is one rider hoping to transform his fortunes after he failed to score at Sheffield. The German packed up twice in what was a disastrous afternoon for him, fortunately older brother Mark, who was making his return from injury, did fare better and scored six points. And Ricky Wells, a former Tiger, was Monarchs’ top scorer with 12 points and a similar score this evening would not go amiss. Workintgon’s Ty Proctor is the replacement for Masters.